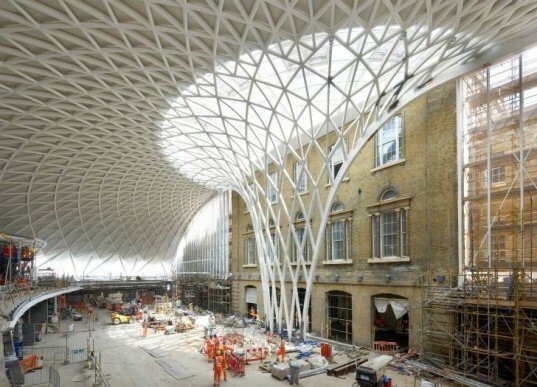 Although still 6 months away from completion, the amazing renovation of London's King's Cross Station is taking shape wonderfully. The massive three-pronged project designed by John McAslan + Partners involves clever reuse, thoughtful restoration and new construction to create a new iconic work of architecture that will serve as a gateway to London and the 2012 Olympics. The restoration of the historic buildings and main train shed is already complete and now all that is left to finish construction on is the centerpiece of the station - the Western Concourse. 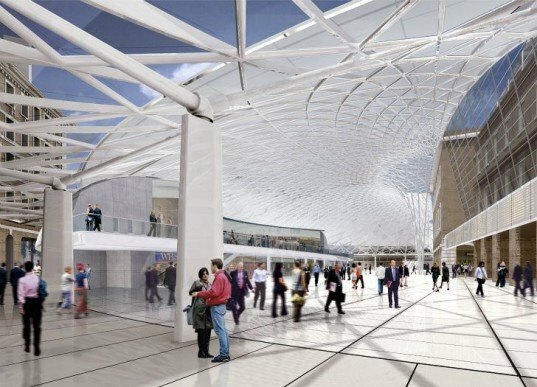 The wave-like semi-circular canopy will be the largest single-span station structure in Europe and will transform the train station with natural daylighting into a welcoming and uplifting space. Originally opened in 1852, King’s Cross is a key station in London’s railway network and its proximity to the St. Pancras mainline station makes it one of Britain’s biggest transport hubs. The solidly built station was unfortunately known to be dingy and dark, so one of the goals of the renovation was to make it feel more inviting and uplifting. The three-part project involved the renovation of the train sheds and surrounding support buildings, as well as a detailed restoration of historic buildings and the classic Victorian facade. The new Western Concourse opens the station up, improves passenger circulation and amenities, and creates a better connection with the connecting metro station. Designed by Arup, the semi-circular concourse rises 20 m in height and spans the full 150m-length of the existing Western Range building by cleverly incorporating the restored brickwork and masonry features of the historic structure. The juxtaposition of the new and the old references the past while surging on into the future. The new vaulted canopy not only brings critical natural daylight into the space, but also provides new retail, support and administrative facilities necessary for the future of London’s rail. hideous - even worse than Pei's pyramids in the courtyard of the Louvre. Why not celebrate the existing, historic edifice instead of trying to obscure it with a massive latticework of shiny white tubes? Ghastly - tear it down. Very cool. Looks like they're grabbing some inspiration from the zeilgalerie in Frankfurt. what about platform 9 3/4? Originally opened in 1852, King's Cross Station is a key station in London's railway network and it's proximity to the St. Pancras tube station make it a one of Britain's biggest transport hubs. The solidly built station was unfortunately known to be dingy and dark, so one of the goal's of the renovation was to make the station feel more inviting and uplifting. The three-part project involved the renovation of the train sheds and surrounding support buildings, as well as a detailed restoration of historic buildings and the classic Victorian facade. Designed by Arup, the semi-circular concourse rises 20 m in height and spans the full 150m-length of the existing Western Range building cleverly incorporating the restored brickwork and masonry features of the historic building. The juxtaposition of the new and the old references the past while surging on into the future. The new vaulted canopy not only brings critical natural daylight into the space, but also provides new retail, support and administrative facilities necessary for the future of London's rail. Construction on the Western Concourse is expected to be complete in March 2012, just in time for the influx of visitors before the Olympics. Passenger numbers are expected to increase to 50 million annually in the station by next year. 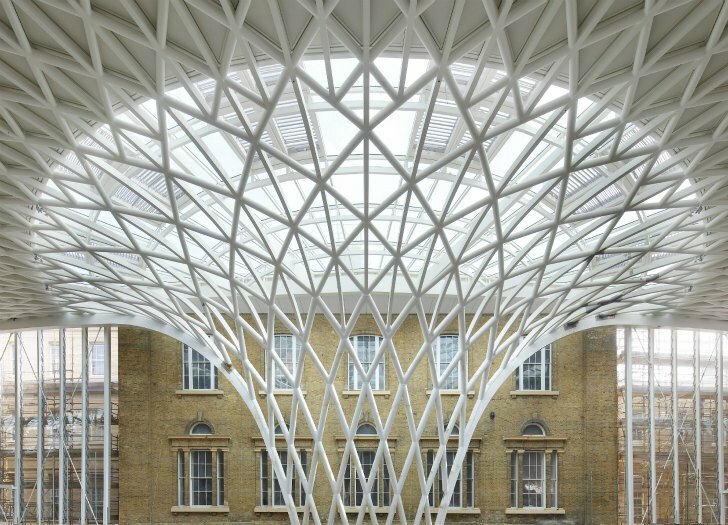 "For the practice, and for me personally, the redevelopment of King’s Cross station isn’t just an exercise in updating an old Victorian railway terminus and creating a vastly improved travelling condition." said John McAslan. "I believe the reinvention and transformation of King’s Cross station is, quite simply, the most significant piece of place-making in London for many years." "And like its near neighbor at St Pancras, it promises to be a marvelous grand project in the great European tradition. So let’s salute this endeavor and look forward to celebrating its completion to coincide with London’s Olympic in 2012." CAD model of the new concourse roof structure. Cut-and-cover tunnelling for Metropolitan Railway circa. 1861. Depiction of station on its opening circa. 1852.